AN ODE TO THE BEST REMEDY FOR BODY AND MIND FROM ONE OF THE WORLD'S LEADING EXPLORERS____________________________________'After having put my shoes on and let my thoughts wander, I am sure of one thing - to put one foot in front of the other is one of the most important things we do. 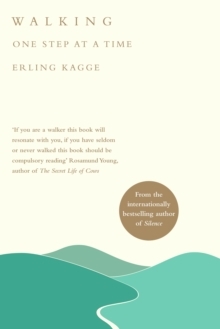 '____________________________________'Erling Kagge is a philosophical adventurer - or perhaps an adventurous philosopher' New York Times____________________________________From the bestselling author of Silence comes an illuminating examination of the joy of walking. From those perilous first steps as a toddler, to great expeditions, from walking to work to trekking to the North Pole, Erling Kagge explains that he who walks goes further and lives better. Walking is a book about the love of exploration, the delight of discovery and the equilibrium that can be found in this most simple of activities. ____________________________________'If you are a walker this book will resonate with you, if you have seldom or never walked this book should be compulsory reading' Rosamund Young'A thought-proving and enjoyable book that revels in seeing the global in the local.